A while ago I noticed some fruit trees growing on the side of various roads around Jamberoo. They looked like peach or nectarine trees, but I couldn’t be sure without seeing the fruit. I kept checking on them every month or so, and early this year saw young fruit that showed they were peach trees. 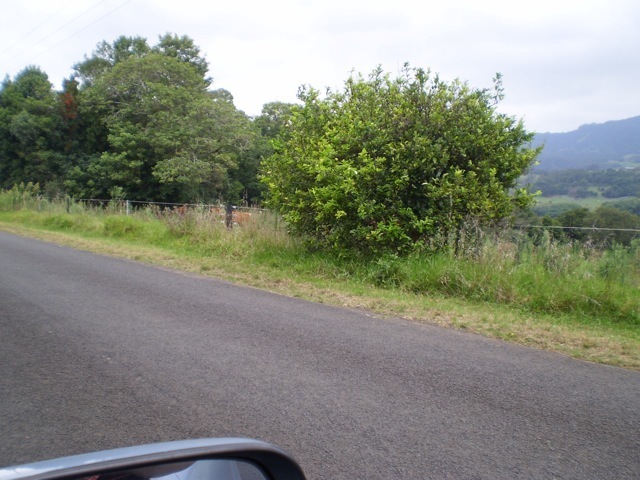 Once a week or so I took the “scenic route” to work through Jamberoo, to check on the progress of the fruit. Finally in late February, the fruit was ripening and beginning to fall from the trees. Time to pick some! The peaches on the trees were mostly still green, but there were riper ones on the ground that had recently fallen. I gathered up a selection and took them home. None of the fruit was particularly good for eating fresh. I guess since they rely only on rainfall, they hadn’t received enough water at the right times for proper fruit development. I figured they’d still be OK to cook with, though. The first thing to do with cooking peaches is to get the skins off. You can fiddle around with a knife and try to peel them, but there’s a much easier way. Simply drop the peaches (a couple at a time) into boiling water for 30 seconds, then scoop them out into a bowl of ice water. You can then make a slice into the skin and peel them by hand easily. 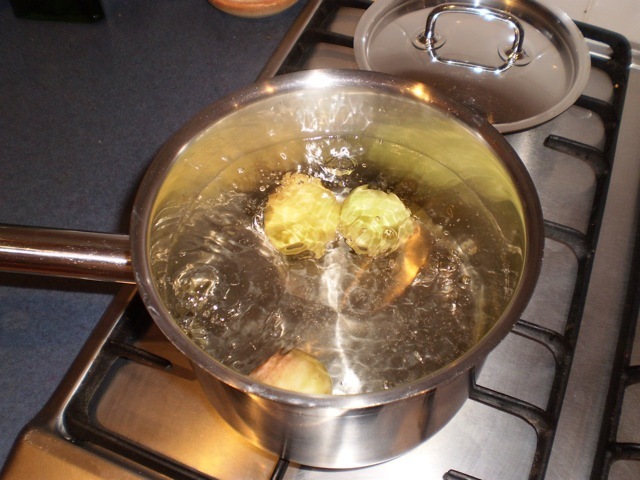 If the skin is still hard to remove, repeat the blanching process and have another go. Return the peeled peaches to the ice water until you’re ready to use them and they won’t go brown. Now cut the peach flesh from the stones. You don’t have to be neat about this – just hack out the stones and throw them in the compost. This is also a good time to remove any bruised or bug-eaten bits. Put all the peach flesh into a saucepan and add just enough water to cover them. I learned a good tip here from my mother-in-law. 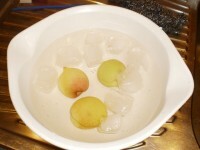 To make stewed peaches (where the flesh is all mushed up), add the peach flesh to cold water and bring to the boil. To make peach chunks (like canned peaches, where the flesh holds its shape) boil the water first and then add the peaches. Stewed peaches are best for making pies, pastries and desserts, so that’s what I went for. Add some sugar to the peaches as the water heats up. You’ll need to use your judgement here – if the peaches were fairly green and firm, add more sugar. If they were sweet and ripe, you won’t need very much. Boil for 15 minutes or so, until they have the consistency you want. Lay out some sheets of frozen filo pastry to thaw. Cut across them diagonally to make two triangles from each sheet. 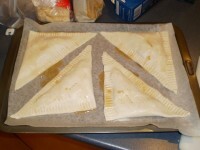 Spoon some peach mixture onto one half of each triangle, lightly moisten the edges of the pastry with peach juice, then fold over and seal the edges. I like to press a fork around the edge to both seal it and give a decorative touch. 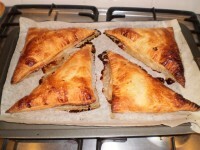 If you want smaller pastries, just cut the filo sheets into smaller triangles. I like the big chunky ones. 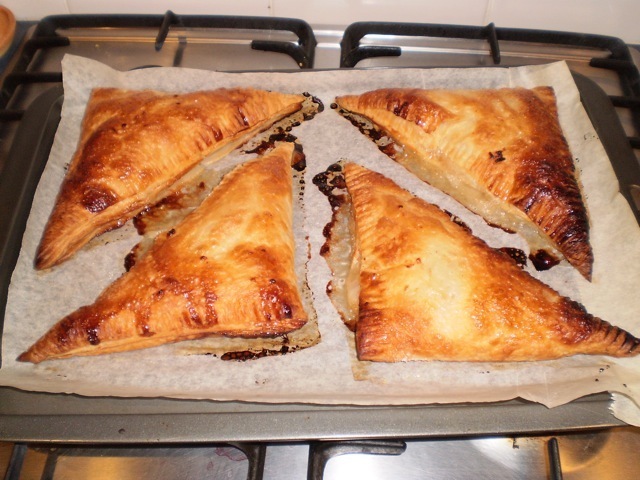 Put the pastries on a tray, and place into a preheated oven. 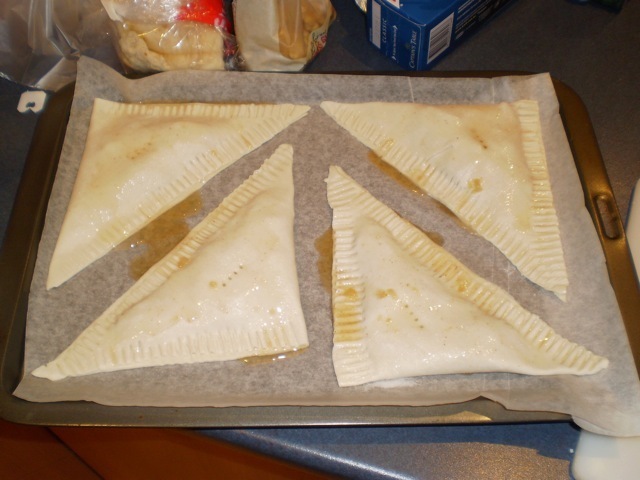 Check the filo pastry packet for the correct temperature – I think it was 180 degrees C or so. 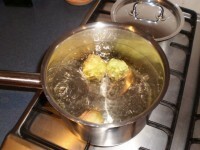 Cook until the pastry puffs up and goes a nice golden brown colour, then remove. You can either serve hot with cream or ice-cream, or cool them on a rack for a nice cold snack. I know it would have been good at this point to set up a pretty photo of a peach filo in a nice bowl, with a scoop of ice-cream on top. Unfortunately they didn’t last long enough for photos! Yum! I read the other day that the University of Wollongong Buildings and Grounds people have a policy to plant Aboriginal bush tucker plants around the campus. There are apparently already over 60 bush food trees/shrubs planted. We should find out where they are and figure out how to get them into a pie! looks yummy! our neighbor’s apple tree hangs over into our yard–i should keep better eye on the apples and try to make apple pie! @Cathy: Yep, if it hangs over it’s “finders keepers”! Although I’m sure the neighbour wouldn’t mind if you made a pie for them as well. Apples are also great sliced thinly and laid out on strips of filo pastry. Sprinkle them with cinnamon and sugar, baste with a beaten egg, and bake in the oven until the pastry browns. Serve with a drizzle of honey and maybe some ice-cream. Yum! I really shouldn’t have read your post before I ate breakfast! Now I want peaches, which aren’t in season yet here. @Condo Blues: When they’re back in season you’ll have to collect as much as you can, process into stewed peaches, and freeze them! Or preserve in jars. Either way, it’s much better than that commercial sugary canned stuff. I’m so looking forward to scavenging for free fruit this summer! With blackberries dying on the vine and apples falling off the trees, there really is so much food that goes to waste in the warmer months. 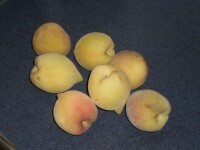 I hope to have the luck to find some wild peach trees and try out your fabulous pastries soon! Thanks for joining us this week for Thrifty Green Thursday! @Greenbabyguide: Thanks for hosting the Thrifty Green Thursdays! I look forward to each ‘episode’, and often pick up a bunch of useful tips. Fruits and berries can be such a “feast or famine” affair. I’ve been learning more about different ways of preserving them, to extend the deliciousness into the off season. I think that’s the real secret! I have just had dinner and now after reading your post I have a sweet craving. Thanks for the tip on how to easily remove skin from peaches. @Chrissy: It’s a lot faster, easier and less messy than trying to peel them with a knife! 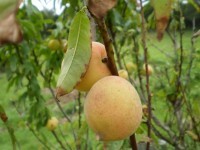 Hi Darren, I am always looking out for wild fruit trees…I wonder if this peach tree still exists…would they be ripe now? you say lillypilly trees are all over the Illawarra…could you email me, and tell me an exact location of where one is? I normally go up the mountain to get wild apples..but I think I may have left it a bit late now? what do you think? do you know of other wild fruit trees around that are easy to get to? @NellyMary: I can’t remember exactly where this peach tree was, but there are some on Jamberoo Rd between Jamberoo and Kiama, and also some between Jamberoo and Albion Park. There’s some up Saddleback too. They’ve finished fruiting for this year, unfortunately. Once you “get your eye in”, it’s surprising how many fruit trees there are growing on the side of the road! It’s too late for most apples now, too – there’s a good one on Abernethy’s Lane just north of Bomaderry. I picked a bucketfull earlier in the year when our pigs were still with us. I do remember seeing heaps of apples along the Hume Highway around Easter time a few years ago, so those ones might still be going up in the cooler climate. There are lillypilly trees fruiting right now in the carpark of Jamberoo Pool, as well as along some of the streets (e.g. Tate Place). There are a few around the Wollongong Uni campus too.